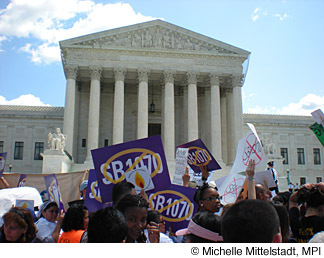 Supports and opponents of Arizona’s controversial SB 1070 law gather in front of the Supreme Court on April 25, the day the court heard oral arguments in the case. With the Supreme Court set to rule in June on the constitutionality of Arizona's controversial immigration enforcement law, SB 1070, all predictions are focused on its key provision — the power of state and local police to inquire into an individual's immigration status. However the court rules on that provision, though, the long-term impact of the ruling may be determined in large part by political dynamics. The tenor of several of the justices' questions during the highly anticipated oral arguments in Arizona v. United States on April 25 has prompted both supporters and opponents of the Arizona law to predict that the central provision of the law will be upheld. This provision requires state and local police officers to determine the immigration status of anyone they stop, arrest, or detain for a crime or offense, if "reasonable suspicion" exists that the person is an unauthorized immigrant. However, oral arguments are not always the most reliable indicator of the outcome of a case. While both sides are bracing for the implications of the court's ruling, whether it upholds one, some, or all of the law's provisions, dual outcomes will likely emerge on the policing provision. On one hand, state legislatures that have been awaiting the fate of the law will feel emboldened to enact immigration legislation modeled after SB 1070, joining a handful of other states (Alabama, Georgia, South Carolina, Utah, and Indiana) that already have passed similar laws. Sixteen states signed an amicus brief in support of the Arizona law — which included Florida, Louisiana, Idaho, Nebraska, Oklahoma, West Virginia, Pennsylvania, South Dakota, and Wyoming. And various states have introduced such bills this year. Thus, state activism in immigration enforcement will gain new momentum. However on the other hand, at least in the short term, the ruling may have little impact on the actual number of unauthorized immigrants removed from the United States. The Obama administration — which has vigorously challenged SB 1070 — has reaffirmed its commitment to prosecutorial discretion and to target federal enforcement resources at removing high-priority criminal aliens who pose a threat to public safety or national security. Most recently, US Immigration and Customs Enforcement (ICE) announced it will no longer detain unauthorized immigrants arrested only on minor traffic violations and who have no criminal history. Thus, given its stated priorities, even if the policing provision of SB 1070 is upheld, the federal government may choose not to remove all unauthorized immigrants who come to its attention following an encounter with local or state police officers. If the federal government decides against moving forward with the removal proceedings, the law enforcement agency must release the detainee within a set period of time. Ultimately, only the federal government can decide whom to remove. Allow officers to arrest immigrants without a warrant who are believed to be deportable based on past criminal offenses. Early in the argument, US Solicitor General Donald B. Verrilli confirmed that the federal government would base its case on the contours of federal versus state power in immigration enforcement, and not on the theory that the law invites racial profiling. Under that premise, the court is likely to rely for precedent on its Whiting v. United States decision in June 2011. In that case, the court ruled that a different Arizona immigration law (the Legal Arizona Workers Act), which requires all employers in the state to screen employees though the federal government's electronic employment verification program, was not preempted or prohibited by federal law. If the Whiting preemption analysis becomes the governing precedent for the SB 1070 case, the court's decision is likely to result in a split ruling — to strike down some provisions and uphold others. The provisions that criminalize work or failure to carry proof of lawful status are likely to be struck down since Congress has enacted laws in these areas. However, the justices did not seem sympathetic to the arguments of preemption regarding SB 1070's policing provision. Arizona has argued that the federal immigration statute encourages states to cooperate with the federal government on immigration enforcement, and that the federal government itself has pushed such cooperation through initiatives such as the 287(g) and Secure Communities programs. This increases the likelihood that the court will uphold the policing provision but may establish some limits to its usage. The ruling may also leave open the possibility that if the provision, as applied, leads to racial profiling, it may invite constitutional scrutiny at a future time. The ultimate long-term implication of the court's ruling on SB 1070 may be driven more by the force of politics than pure legal considerations. Since the federal government rarely challenges states' statutes on preemption grounds, the Obama administration's decision to intervene in SB 1070 and similar state laws is seen as an unusual and bold effort to thwart such state action. A favorable ruling for Arizona on the policing provision would be seen as a major loss for the administration and a victory for the law's architects and proponents, even if the court strikes down the law's other three provisions. But such a ruling could galvanize Latino voters around the immigration issue nationwide and especially in Arizona, which has been pegged as a critical swing state and where nearly 30 percent of the population and 18 percent of registered voters are Latino. The presidential election could potentially make a significant difference. Creating priority levels in the removal of criminal unauthorized immigrants is, after all, an Obama administration policy. If in November presumptive Republican nominee Mitt Romney is elected president and he decides to maximize the removals of unauthorized immigrants and support increased state engagement in immigration enforcement, the Supreme Court ruling could lead to a dramatic increase in deportations. Indeed, the Republican-controlled House on May 9 passed an amendment to an appropriations bill that would bar the US Department of Justice from bringing a legal challenge to state immigration enforcement laws. A Supreme Court green light on the policing provision will lead other states to pass SB 1070-type legislation, which in turn may increase the number of states experiencing the unintended consequences of such laws. If states such as Alabama and Georgia are any indication, the concern is that certain business groups in those states are put at a competitive disadvantage — especially in the agricultural sector. Already, these groups have increasingly and openly communicated their concerns to state lawmakers. If similar pressure grows in other states, their legislatures may lose enthusiasm for taking on enforcement of immigration laws, and instead demand that Congress and the federal government once again take charge and adopt a national immigration enforcement policy. For more information on the details on the provisions of SB 1070 and the controversy surrounding the law, read the May 2010, August 2010, April 2011, and December 2011 Policy Beats. Read the transcript from Supreme Court oral arguments in Arizona v. United States. Senator Marco Rubio to introduce GOP DREAM Act. Senator Marco Rubio (R-FL) is discussing plans to introduce a version of the Development, Relief, and Education for Alien Minors (DREAM) Act, which he has coined "the conservative alternative" to the original legislation. The Rubio legislative proposal, still a work in progress, would grant legal status to unauthorized immigrant children whose parents brought them to the United States at a young age, and who have since continuously resided there, are high school graduates with plans to attend college or join the military, and have no criminal record. Beneficiaries of the legislation would be allowed to lawfully work and study in the United States, and obtain a driver's license. However, unlike the original DREAM Act, Rubio's alternative would not offer a direct path to lawful permanent residence. It would instead grant beneficiaries of the legislation temporary visas and would allow them to acquire permanent resident status and eventual citizenship only through options in the existing immigration law. Supporters of the Rubio proposal say it strikes a fair balance between humanitarian concerns and respect for immigration enforcement. Critics have suggested political motivations behind the proposal, arguing that it is intended to increase the standing of the GOP within the Latino community in an election year. Other critics of the proposal, including many immigrant advocates and some Democratic lawmakers, cite concerns that, in the absence of a pathway to lawful permanent residence, the proposal would create a second-class status for its beneficiaries. Notwithstanding the lack of a direct path to legal permanent residence, many who favor limiting immigration, including some Republican lawmakers, have decried the Rubio proposal as an amnesty. Read about the GOP Dream Act in the New York Times. See the Migration Policy Institute's analysis of the original DREAM Act and its potential beneficiaries. Learn about Senator Rubio's immigration positions. New Pew report finds Mexican immigration decline. A new Pew Hispanic Center report has found that net Mexican immigration to the United States has slowed to zero — and perhaps reached a negative level — for the first time since the Great Depression. According to the study, increased return migration to Mexico has outpaced incoming immigration. The Pew study, citing 2010 Mexican census data, indicates that Mexicans are now returning to Mexico at double the rates they did between 2000 and 2005, and that Mexican migration to the United States has abated significantly. There are now an estimated 6.1 million unauthorized Mexicans living in the United States, compared to almost 7 million at the peak in 2007. The study attributed the drop to myriad reasons, including the state of the economy and high unemployment in the United States, increased deportations, and demographic changes in Mexico. Read the Pew Hispanic Center study. Surge in immigrant minors found along the border leads to use of military base to hold them. The number of unaccompanied migrant children intercepted at and between ports of entry on the US-Mexico border has surged in recent months. Between October 2011 and March 2012, 5,252 migrant children arrived in the United States without a guardian, 1,390 of them in March alone. This represents a 93 percent increase compared to the same time period one year ago. Unaccompanied minors come predominantly from Guatemala, Honduras, El Salvador, and Mexico. They first are processed by the Department of Homeland Security (DHS) and then referred to the Office of Refugee Resettlement in the Department of Health and Human Services (DHHS), which places most of them in shelters during the initial stage of their immigration proceedings. The sudden influx of these unaccompanied minors has prompted DHHS to begin housing them in a makeshift space at Lackland Air Force Base in San Antonio, Texas. There is no clear explanation for the upturn in the arrival of the minors. It has been hypothesized that an increasing number of unauthorized immigrants living in the United States are sending for their children as bolstered border enforcement has deterred the parents from making periodic visits to their home countries. Read about unaccompanied immigrant minors in the January 2011 Source. DOJ Issues new rules on J-1 Visa. The State Department has issued a set of major rule changes to its J-1 Summer Work and Travel Program, which allows more than 100,000 foreign college students to live and work in the United States for up to four months every year. The proposed changes come after an investigation into the program revealed a need to safeguard participants against exploitation — including low pay and poor working and living conditions. The proposed reforms focus on increasing oversight and vetting of employers, more closely monitoring participants' experiences, and eliminating certain job categories for participants to be placed. The rules also protect US workers from being displaced by J-1 employees and require employers to demonstrate that they have recently not laid off any US workers. Learn about the State Department's J-1 Summer Work and Travel Program. TPS extended for Somalia. US Citizenship and Immigration Services (USCIS) has announced it will extend Temporary Protective Status (TPS) an additional 18 months (to March 17, 2014) for eligible nationals of Somalia. Under the Immigration Act of 1990, the United States may grant TPS, which includes work authorization and protection against deportation, to qualified foreign nationals residing in the United States who the US government determines are temporarily unable to return to their home countries for issues such as safety concerns. Somalis in the United States first received TPS status in 1991 due to ongoing armed conflict in Somalia. The current designation has been extended nine times. Read more about TPS at the USCIS website. Supreme Court to rule on Padilla retroactivity. The Supreme Court will review Chaidez v. United States to determine whether its ruling in a previous landmark case, Padilla v. Kentucky, can be applied retroactively. Padilla held that a person's Sixth Amendment right to effective counsel is violated if his/her lawyer in a criminal proceeding fails to advise that pleading guilty to a criminal offense will subject him/her to deportation. In Chaidez, the court will decide if Padilla can be applied retroactively to individuals who were criminally convicted before the court's March 2010 decision. Chaidez is a legal permanent resident who pleaded guilty to fraud (which is an aggravated felony if the loss to the victim exceeds $10,000) in 2007 after her lawyer did not inform her that the conviction would subject her to deportation. Chaidez was placed in removal proceedings in 2010 when she applied for naturalization, and attempted to vacate the fraud conviction on the grounds of the then recent Padilla ruling. A US district court ruled in favor of Chaidez, but the US Court of Appeals for the 7th Circuit reversed the decision, finding that Padilla could not be applied retroactively. Learn about Chaidez v. United States on the Supreme Court's website. Read the Padilla v. Kentucky Supreme Court opinion. ICE initiates new set of I-9 audits. US Immigration and Customs Enforcement (ICE) has initiated a new wave of audits targeting employers who have failed to verify the legal status and employment authorization of their employees. While the new set of audits has not been announced, an ICE representative has confirmed that I-9 forms and records, which can be reviewed to determine compliance with hiring laws, have been requested from 500 companies across the United States. When audits detect unauthorized hiring violations, ICE fines employers and unauthorized workers are terminated from their jobs. Under current ICE policy, workers typically are not apprehended. Audits are considered to be a useful tool in stemming the employment opportunities that drive illegal immigration in the first place. Critics of the practice, however, fear that audits will strip many firms of needed workers and will particularly impact the agricultural industry where a sizable section of workforce is not authorized. Others say the resultant job loss will push many individuals into the informal economy and poor labor conditions. Additionally, controversy over the effectiveness of I-9 audits has arisen, as the paper-based verification system is susceptible to fraud. Read the Wall Street Journal article about recent ICE audits. National Guard withdrawing 900 troops from the border. The 1,200 National Guard troops who have been deployed to the US-Mexico border since 2010 to help the US Border Patrol build roads and conduct surveillance will be scaled back. Citing concerns that National Guard placement on the border has harmed morale and recruitment efforts, in addition to creating risk of diplomatic fallout with Mexico over heightened militarization at the border, Defense Secretary Leon Panetta ordered the withdrawal of 900 troops, leaving 300 whose duties will shift to flying surveillance aircraft and analyzing intelligence. Read the Los Angeles Times piece on the National Guard withdrawal. Secure Communities Launched in MA, NY. ICE expanded its controversial Secure Communities program to Massachusetts and New York on May 15, despite long-running opposition to the program from both state governors. Secure Communities is an immigration enforcement program that allows federal officials to check whether individuals arrested at the state and local level are deportable by running their fingerprints and biographic information against federal immigration databases. While ICE officials praise the program for assisting in the removal of criminal aliens, critics including Massachusetts Governor Deval Patrick and New York Governor Andrew Cuomo assert the program primarily nets low-level offenders and undermines community policing efforts. With the expansion of the program in Massachusetts and New York, Secure Communities will be operating in an estimated 89 percent of state and local jurisdictions. Read more about Secure Communities in the March 2011 Policy Beat. Check out the list of activated Secure Communities jurisdictions on ICE's website. Read the new complaint filed by DOJ against the Maricopa County Sheriff's Office and Sheriff Arpaio. Read more about the controversy surrounding MSCO's and Sheriff Arpaio's policing practices in the February 2012 Policy Beat. US district court blocks implementation of new H-2B rules. In a lawsuit brought by five companies and advocacy groups in landscaping and forestry industries and by the US Chamber of Commerce, a federal judge in Florida ordered a preliminary injunction against a Department of Labor (DOL) rule on the H-2B program just days before it was set to be implemented. Under the H-2B program, employers can hire foreign workers on a temporary or intermittent basis to perform nonagricultural work. The new DOL rule would require employers of H-2B workers to guarantee 75 percent of contractually agreed upon hours or equivalent compensation; wages and benefits for H-2B workers on par with US workers; and coverage of airfare and subsistence costs. It would also stipulate new recruitment practices aimed at hiring US workers before H-2B workers are sponsored, lower by one month the period H-2B employees are allowed to be in the United States at one time, and protect H-2B workers from being responsible for the payment of filing or legal fees during the recruitment process. Critics of the rule, predominantly from the business community, say the new measures are overly onerous and would drastically raise operating business expenses. Advocates of the rule, mostly from labor and migrant-rights communities, say the new rules would protect workers from exploitation and abuse while penalizing only businesses that misuse the H-2B program. Learn about the H-2B program at the USCIS website. Read about the case at the US Chamber of Commerce's website. Bill to allow unauthorized immigrants to pay in-state tuition fails in Colorado. State lawmakers in Colorado rejected a measure that would offer unauthorized residents in-state tuition at public universities. According to newspaper reports, the measure would have placed the annual cost of attending the University of Colorado-Boulder at about $9,500 for unauthorized residents, compared with about $7,700 for Colorado residents and $28,850 for out-of-state students. Unlike Colorado residents, unauthorized students would not be eligible for a state subsidy. Thirteen states — California, Connecticut, Illinois, Kansas, Maryland, Nebraska, New Mexico, New York, Oklahoma, Texas, Utah, Washington, and Wisconsin — have successfully passed measures allowing in-state tuition for unauthorized students. Lawmakers in favor of the measure stressed that the cost of higher education should not be prohibitive for students due to their immigration status, many of whom were brought to the United States by their parents as children, and all of whom have been schooled in Colorado's education system. Those opposed contended that college degrees are still available to unauthorized immigrants at out-of-state tuition rates, and that a college degree would not change these students' ineligibility for employment. Read the Denver Post article on the in-state tuition bill. DOJ Files Lawsuit Against Maricopa County Sheriff. The United States Department of Justice (DOJ) formally filed a lawsuit May 10 against the sheriff's office in Maricopa County, Arizona, as well as Sheriff Joe Arpaio. The suit alleges that the Maricopa County Sheriff's Office (MSCO) and Arpaio have conducted discriminatory and unconstitutional law enforcement actions targeting Latinos, discriminated against detainees with limited English skills and engaged in illegal retaliation against critics of its policies. According to DOJ, the complaint was filed after months of negotiations between the two parties broke down when Sheriff Arpaio refused to agree to independent oversight of his agency. The federal government first initiated a civil rights investigation against the Maricopa County Sheriff's Office in June 2008. Manchester, NH considers a moratorium on refugee resettlement. The New Hampshire Legislature is considering a bill that would authorize local governments to place a one-year moratorium on refugee resettlement in cities and towns. The legislation would prevent the placement of refugees even when their family members are resettled and living in the towns and cities that have enacted a resettlement freeze. The measure was introduced in response to pressure from the mayor and several state representatives from Manchester who believe that high levels of resettlement in the city are straining local resources. It has passed in the state House and awaits vote in the Senate. Manchester has accepted 1,807 of the 2,966 refugees resettled in New Hampshire from 2002 to 2009. The majority of refugees resettled in New Hampshire since 1997 are from European or African countries. Learn about refugee resettlement in New Hampshire at the state Office of Energy and Planning website. Read HB 1405 as introduced.